Pianist and fortepiano specialist Christina Kobb is currently completing her Ph.D. at the Norwegian Academy of Music. She spent the academic year 2009/2010 at Cornell University, kindly invited by Professor Malcolm Bilson and the Cornell Graduate School. 24 October 2010 marked the seventy-fifth anniversary of pianist and early music specialist Malcolm Bilson. Several decades have passed since he first appeared on stage with the eager and communicative appearance that has come to excite audiences on all continents. Bilson has made a name for himself as one of the world’s leading performers of late eighteenth- and early nineteenth-century piano music, and probably loves teaching just as much as performing. In addition, he is as articulate verbally as he is in his playing, which has made our conversation jump swiftly from one key topic to the other. Having started out as any other ‘normal’ pianist, Malcolm Bilson’s career took a different turn one day in 1969 when a builder of antique instruments, Philip Belt, introduced him to what he called a ‘Mozart piano’. The so-called Early Music Movement had been reviving baroque instruments starting in the 1950s, and in Europe a few keyboard players had started to play original pianos as well. However, this was no immediate success as the old instruments were often in poor condition and the knowledge of restoration techniques was not what it is today. Philip Belt was a real pioneer in building outstanding replicas of early pianos (by copying the antique instruments). Bilson, then a young member of the piano faculty at Cornell University, embarked on an exciting journey, rediscovering keyboard music of the classical and romantic eras on the instruments from the time when the works were created. 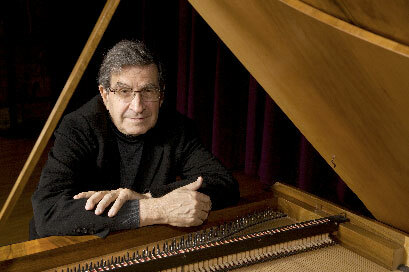 In the almost forty years that have passed, Bilson’s recording highlights include the first complete original instrument recording of the Mozart piano concertos with The English Baroque Soloists and John Eliot Gardiner, the complete Mozart and Schubert piano sonatas and — together with six of his former students — the complete Beethoven piano sonatas. And the adventure is not over yet. For even if his birth date could fully justify a relaxed existence as a retired Cornell professor, Malcolm Bilson still keeps up a busy schedule. When not giving concerts in the US or around the world, his commitment to inspire the next generation of pianists is a major priority. In addition to teaching and conducting master classes, he is now planning his second DVD production about basic performance issues. The first one,Knowing the Score, released in 2005, focused on understanding musical notation of the late eighteenth and early nineteenth centuries. ‘Performance practice should include much more than playing on an early piano or picking up a baroque fiddle’, Bilson stresses. ‘As a matter of fact, people have the odd concept that in some way the modern instruments are simply more expressive and when you go to the earlier instruments you are playing with less romantic expressivity. This is the first thing we need to address’. And with that, our talk was launched; a conversation that would come to include not only reflections on early music and performance practice, but also the art, hardships, goals, and indeed schizophrenia involved in the act of being a performer. And one cannot talk to Malcolm Bilson without returning to the pianos themselves at regular intervals. A couple of weeks ago, you came back from an extended visit to Europe where you worked both with various ensembles and with pianists. You mentioned to me that this had made you think differently about Early Music and its influence on the greater musical world today. In 1976, I gave a concert in Boston on a fortepiano. The reviewer of the Boston Globe wrote that by the year 2000, most performances of Mozart, Haydn and Beethoven would be on period pianos rather than the ubiquitous Steinways. Now you may have noticed that this has not actually occurred. But the reviewer, Michael Steinberg, was not completely off the mark, because such a phenomenon actually did take place, only not in the piano world — in the orchestras! Starting in the 1970s with the recording of the complete Mozart symphonies by Christopher Hogwood and the Academy of Ancient Music, by year 2000, virtually the entire orchestral repertoire had been recorded on early instruments, from the Haydn Symphonies right up the later repertoire of Brahms and Wagner; with both the Mozart and Beethoven symphonies being recorded several times. Now, since 2000, interestingly enough, there has been a sort of rapprochement of early and modern orchestras. A few years ago I played in Leipzig with the Chamber Orchestra of Europe. The orchestra players were all using modern instruments, yet most had studied with Nikolaus Harnoncourt, and also played in early music bands under such conductors as John Eliot Gardiner and Roger Norrington. They knew the performance parameters that had been learned from the old instruments! More recently Sir Simon Rattle has recorded the Beethoven symphonies with the Vienna Philharmonic, in a manner so different from what that orchestra usually does that there is a note in the CD booklet explaining this departure from their normal tradition. So if you want to buy a recording of Beethoven’s symphonies today, what is the percentage of releases on original instruments to modern ones? It might be something like 30% of original instruments to 70% modern instruments. But at the same time, what is the ratio of Beethoven piano sonatas played on original pianos and on Steinway types? 1% on Beethoven-era pianos might be a bit high! It seems as though virtually every week someone comes out with a new set of Beethoven sonatas on pianos radically different from anything that Beethoven would have ever known. So we can say that in the musical world in general there is movement, yet the piano world, with some notable exceptions, is probably some fifty years behind. Those are pretty strong words! Are you implying that orchestra members understand matters of performance practice so much better than pianists? One of the reasons, I believe, that all the other instruments can in some sense accommodate these earlier kinds of expressivities is because all other instruments produce the sound continuously from beginning to end. That is to say, a violin can start a note and then crescendo, it can go up in the middle of a tone, play an accent anywhere and do whatever it wants — a piano can only effect the beginning of the sound, at the point the hammer hits the string. After that the ‘decay’ (our lovely English expression) is ‘set at the factory’. We can of course interrupt the decay, and cut it off by bringing down the damper. Now sometimes you see pianists who wiggle their finger on a key like a vibrato, and maybe it makes them feel good, but it obviously doesn’t do anything to the sound! The modern piano is a very superior instrument for playing long, seemingly legato lines, and it is also very superior at staccato. But it is not very good at note lengths in-between, which is exactly where all the action is in the music of Haydn, Mozart and Beethoven. We know from every source of the period that the length of the note is much more important than the loudness or the colour (although these also contribute much to the musical message, to be sure). There is a light upbeat followed by two slurred notes and one staccato note. You won’t hear that on any recording on a modern piano. Rather, all you hear in any version is a continuous legato. Because if you try to play even the light upbeat (required due to the metre of 3/8) the damper will come down on the string while the tone is developing and it sounds like a hiccup, so no musical person would do that. This is extremely natural and easy to do on any piano that Beethoven knew. To put this into perspective, look at a piece by Rachmaninoff, the ultimate Steinway composer! It can sound very voluptuous on a modern grand piano, with a continuous legato and big luscious chords. You can still play his music on an Erard of 1860 or so, which is perhaps not quite as rich, but will still have much to offer. But try to keep going, try it on a Graf fortepiano of the 1820s, or even more extreme, on a five octave fortepiano from 1780. The notes are there (if you’re playing a piece that doesn’t use the extreme range of the modern piano), and a fine musician can play flexibly and musically, yet it would lack the ‘essence’ we value in this kind of music! Why is the situation any different when playing Mozart on a Steinway? The only real difference is that this is what most people are used to hearing. I’ve finally gotten bold enough to say that if you’re really interested in getting at Mozart’s or Beethoven’s aesthetics, you cannot really achieve it on a piano that is as different from what he knew as a Graf would be for Sergei Rachmaninoff. Do you mean that the music is so intrinsically tied to the actual piano model available? Is not the music valuable also ‘on its own’, independently of the instrument? Now, there were big changes in performance parameters across the nineteenth century. Between about 1800 and about 1850/60 we find the biggest changes, in some basic ways far bigger changes that existed between 1860 and now. After 1800 public concerts necessitated public concert venues, larger rooms which needed larger instruments to fill them — not only bigger instruments, but also a grander, more expansive kind of tone production. You and I are now talking over my kitchen table, but if I were in a big hall talking to a big crowd, I would change my voice considerably. Now many music schools and conservatories, both here and in Europe, order a fortepiano and it often just sits unused. I think I understand why most pianists don’t play them. We all learn what I would call basic expressive parameters, and by that I don’t mean how we use our fingers or the bow, but how we make music. Of course we make music through the fingers, the bow, and the reed, but basically we all learn a kind of musical language, and, if we’re any good, we learn to be expressive in a very, very particular way that suits the particular instrument we are playing. All modern pianos, as I hope every reader knows, are based on the Steinway recipe of 1870: cast iron frame, grain of the soundboard running from treble front to bass rear, crossed stringing, Erard repetition action, large felt hammers. There are absolutely no exceptions to this recipe in any of the great brands. So basically, what we have today is a piano from 1870 which was ideally suited to the long, singing lines so in vogue at the time. One only has to look at any edition from that period to see Mozart’s fine speaking articulation changed to long phrases. Recently I played a Mozart, Haydn, and Beethoven concert on a Walter piano in Parma, Italy. The next day I wanted to prepare for my next program — Chopin, Schumann, and Mendelssohn on a Graf-type piano a few days later in Vienna — so I went to the Boito conservatory in Parma where they kindly gave me a very nice Yamaha grand to practice on. But I soon became quite frustrated because the expressive things I was used to getting on the instruments I knew were simply not available, any more than most pianists used to Steinways and Bösendorfers would get what they wanted out of a Graf piano. So you say that the basic musical language changes with the various types of pianos? I certainly do assert that. Part of the problem is that we live in a world in which there is only one kind of piano. The reader might not be aware of the fact that if you go back forty years, Bösendorfer, Steinway, Yamaha all had different actions (mechanisms), whereas nowadays every piano has an action similar to the Steinways, so young pianists never get anything different under their fingers. It is true that there are a lot of new pianos being built by interesting, new companies. I haven’t seen all of these, but I often see them reviewed and the number one quality listed (if the reviewer likes the instrument) is power. It’s almost as though that is the only thing anyone cares about. Yet the better the piano is for playing Rachmaninoff concertos in a large hall, the less good it’s going to be for chamber music and solo works which require some intimacy when played in a smaller hall. Now I’m only talking about the modern piano, but even in the case of modern pianos, if you go back to the 1930s there was far more variety than today. Bechsteins, Blüthners, Bösendorfers used to be very different pianos from the Steinway, and certain pianists preferred the one or the other. Today, although there are some differences between the various models, it is nothing compared to what existed in the 1930s. Actually, I am convinced that most pianists don’t actually know what a piano is! As Goethe said: ‘A man who does not know foreign languages will be ignorant of his own’. This is true of virtually everything. Imagine a world with a single type of wine or a single model of automobile driven for 130 years with no other model available. In 1892 Anton Rubinstein was asked: ‘Don’t you think that our modern pianos are better for the music of the old masters?’ Rubinstein retorted ‘Absolutely not! Every composer writes for the instrument of his time, and on our modern instruments much of this music sounds at a disadvantage’ [unvorteilhaft]. Arthur Rubinstein, 100 years later, could never have said that, because he would not have known all those earlier models. Franz Liszt endorsed sixty different kinds of pianos; Russian pianos, American pianos, German pianos, Hungarian pianos. Liszt would have been absolutely astonished at how much variety has shrunk in the last 140 years! For myself, I always adored pianos, even before I got to know the historic ones. There’s nothing wrong with it! Why would anything be wrong with it? But you must remember that there are two distinct things you hear when you listen to any artist: One is what he or she is doing and the other is how beautifully or imaginatively they are doing it. The artists we generally admire the most are those who are the most inspired, who get carried away, who have convictions and a sense of form — all of these things are true. But at the same timewhat they base their inspirations on can be very different. I am speaking here of the basic language. But you just said that it would almost impossible to play for instance the opening of Beethoven’s op. 26 on the modern piano? I didn’t say that! I said, ‘Can you play what Beethoven wrote?’, which is quite different! Because, if you’re going to insist on playing Beethoven’s articulation on a Steinway type piano, you might not get something that sounds very artistic. I certainly wouldn’t do it. The interest of these early instruments is not even so much in how they sound, it’s that when you start practicing on them, you get into another expressive world. What I am looking for is the next Alfred Brendel, Richard Goode, or Vladimir Ashkenazy who plays and learns on many pianos. It is much easier for you than it was for me, and it will be still easier for the next generation after you, because there are more and more excellent instruments available. And many of them are just sitting there waiting to be discovered! Kristian Bezuidenhout was a student at the Eastman school of music, where I teach part-time. He discovered a Walter copy they had there when no one else was using it, and he now has a big career playing many kinds of pianos with both early and modern orchestras. But let’s be realistic: For conservatory students who play orchestral instruments, the motivation to pick up an early equivalent might be fueled by the extra money they can make on a weekend gig with the local Baroque orchestra, where they are often lent an instrument as well. With some instruction from more experienced players, a wind or string player will relatively quickly be able to play well enough in the group. So for what practical reason would conservatory pianists learn period instruments? Let’s go back to Kris Bezuidenhout. First of all, if you’re a piano student in a conservatory, how do you make money? You teach piano students or work as an accompanist for various occasions. Aha! What piano might violinists want to play if you’re playing a Beethoven violin sonata and one of these fortepianos is available? Every violinist knows how overpowering a Steinway is in chamber music. Once they discover these early instruments they realize how far superior they are, especially from the point of view of balance. Kris Bezuidenhout was very busy as a student at Eastman, and probably had much more work than most of the other piano students. Many, including much of the faculty, only wanted to play with him. It is actually very practical because there are far too few people doing it, and it is in ever increasing demand. It must be said that Kris Bezuidenhout is a brilliant pianist and exceptional musician, so this policy won’t work for a mediocre talent. But let’s be rational — yours and my interest in this is not because we want to make money. If that were what we wanted we would clearly be in the wrong business! I think that we’re doing it because we’re passionate about the music, and we feel that this avenue brings us closer. We must never forget that the word ‘instrument’ means ‘tool’. The really important thing here is to use this tool to learn earlier musical languages; a language of inflexion and not just a long, singing line. I can’t demonstrate that in an interview, but that’s what it’s really all about. The early instrument orchestras are now in their third generation. One young violinist talked to me about the fact that she is of the second generation and says that ‘it’s good, but it’s not so good’. The first generation really had to work everything out themselves, but by the time you get to the second generation you’re simply being told ‘this is the way we do it, dear!’ And when you get to the third generation, it’s even more solidified and can start to become routine. But there is no such tradition among pianists. If one is interested in going down this path, one still has the good fortune of being one of the first generation! You, of course, are here at Cornell studying with me, but I hope that I am never guilty of saying ‘this is the way we do it’. I hope that I say ‘look, this is the way I think we do it, but maybe you have some other idea’. We often argue, which I find perfectly healthy! It’s good when it is still both accepted and expected that you go to the sources and look for yourself and base your opinion on the primary sources. That’s the problem with most conservatories. The only accepted wisdom is what the teacher tells you. If a young person at virtually any important conservatory wants to start studying the sources, he will probably get in trouble with the teacher. The Hungarian conductor Iván Fischer talks about studying in Vienna with both Nikolaus Harnoncourt (early performance practice) and Hans Swarowsky (standard modern practice) at the same time in the 1960s. He claims it often made him quite schizophrenic! But he also thinks it was good for him, and I think we probably need a bit more schizophrenia in the music conservatories, in order to get away from so much conformity. You are still enjoying a successful career as a fortepianist despite all the possible obstacles we have talked about. (Before I can finish my question, Bilson interrupts, objecting to my use of the words ‘fortepiano’ and ‘fortepianist’. The terminology is confusing due to different meanings in different languages). I like to think of myself as a pianist who plays on many pianos, and not as a pianist who plays either one kind or another kind. Nevertheless, you are right that I haven’t played too many concerts on Steinway-type pianos lately. Looking back; what have been the biggest challenges for you over the years and how did you deal with them? Well, everything is a challenge! I was very lucky because the piano that Philip Belt brought to me back in 1969 was really quite beautiful. My good fortune was that the piano was totally even from top to bottom, a pleasure to play, and everything worked. Still, no one would build exactly such a piano today because it had very strange material for the wire, funny dampers which were not like they ought to be, and so forth. But I can show you from the first recordings I made back in the 1970s that it was a quite handsome sounding instrument. Had it been some sort of rattle-trap it would likely have turned me off. But look at these hands; these are hardly hands for playing a light instrument with a small keyboard! I can stretch a twelfth on a modern piano and should be playing Rachmaninoff and César Franck, for I certainly don’t have natural facility for these light little things. But I got bitten by the bug and I wanted more pianos, so I ordered the first Graf copy. It was quite an achievement at the time, but not really beautiful, so I sold that and got another larger piano, and so on down the line. You might say it has been one challenge after the other and of course, if I hadn’t done all of this, I probably would have a much bigger repertoire than I do because I spent so much time of my life doing pioneer work. But I had such a great time doing it! And now, I feel that you and the next generation should have it easier. You know, my predecessor here at Cornell was John Kirkpatrick, a Charles Ives specialist. He spent many years working on Charles Ives’ Concord Sonata, which is extremely difficult, and he played it in 1939 in the Town Hall in New York to great success. Nowadays students learn it in a month or two at the Julliard. And that’s the way it should be! Somebody has to do pioneer work, and the next generation should do it faster. Alfred Brendel says that when he was twenty-five, he decided where he wanted to be at age fifty and he thinks he got there. That’s what every young musician should do! You say to yourself: ‘I am me and this is where I want to go. This is what I think is interesting, what is rewarding for me and what makes me sleep well at night, and this is what I want them to write on my gravestone’. That’s my recipe! It’s a nice thing to think about. By the way, do you know who Peter Ustinov was? A very funny man. He said that he wanted on his gravestone ‘Please keep off the grass’. We laugh and Bilson concludes: ‘Anyway — that’s enough! It’s time to go back to work’. As our talk is over, he is eager to get up from the kitchen table and back to his desk. Age seventy-five is no excuse for Malcolm Bilson to relax. In fact, he is probably more insistent than ever, still applying his relentless curiosity to musical matters. The scheduled recording session for the new DVD is only a few weeks away and he wants to be prepared, as he says, ‘so as not to say any Dummheiten I will later regret’. During the one and a half hour interview, we touched on a variety of subjects, and to be honest, I even hoped to learn a few ‘secrets to success’ from a man I thought would be able to provide some answers. But as talkative as Bilson normally is, he became quiet when such questions came up, and suggested that we skipped them. However, after a while, he started to reflect on the matter, taking a well-known and virtuosic Russian pianist as example: ‘He is very brilliant, but I don’t like him very much. But of course he’s a star! How does one tell people how to become a big star? You can’t teach anyone that. And it’s not something that interests me anyway. I was always interested in developing my musicianship as much as I could, and after I’ve done that and learned a piece, I would perform it and it’s up to the audience whether they like it or not. That’s how I look at it. If people like you, you’d be invited back and if not — well, you won’t be! But there’s no recipe for this’. In a musical world, where ‘people pleasers’ abound, there is certainly room for performers who dare to play differently from the crowd and to do so with excellence. Is this reconcilable with a ‘historically informed performance’? Don’t we have to ‘follow the rules’? When it comes to execution in general — Vortrag — one of the first paragraphs emphasized in nearly all instrumental treatises from the classical period is how the performer must be able to express emotions in his or her playing. Or, as Czerny states in 1829 (Pianoforte-Schule op. 500, III (1839), § 2): ‘The real aim of the art … is to put spirit and soul in the execution’ [Geist und Seele in den Vortrag zu legen]. This quality is certainly a prominent one in Malcolm Bilson’s musicianship. In our discussion about pianos, gravestones and various other aesthetical matters, Bilson did not tell me what he wants written on his own gravestone. It is tempting, though, to wonder if it might not be the title of the forthcoming DVD: Performing the Score.